To stop your dog from itching, you'll need to figure out what's causing the allergic reaction so you can avoid it. Our canine companions can be allergic to many things, including foods, pollen, dust, fragrances and fleas. To determine the cause of your pup's itchy skin, bring him to the vet for a proper diagnosis and to develop a treatment plan. When a dog comes into contact with something he's allergic to, a substance known as an allergen, his body's immune system produces chemicals called histamines. Histamines cause inflammation, leading to a variety of problems including skin issues, gastrointestinal upset and respiratory congestion. Symptoms of allergies include sneezing, vomiting or diarrhea and itchy, red, crusty or swollen skin all over the body or localized to one area. Usually the itching occurs on the paws, back, the base of the tail, groin and around the ears. If you notice your pooch is licking or chewing at her skin, get her to the vet to determine if allergies could be to blame. Most allergens are proteins, although any substance has the potential to cause an allergic reaction in your dog. Your dog may come into contact with these allergens or he may ingest or inhale them. Common causes of contact and inhalant allergies in canines include pollen, mold, cigarette smoke, perfumes, products containing insecticides, cleaning products, fleas, medications, dust and dust mites. Dogs with food allergies may react to certain meats, carbohydrates or other additives in the food they are eating. Your vet can determine the cause of your pup's itching through diagnostic tests and allergy testing. Once you know the allergens causing your pup's itching, eliminating them should stop his skin irritation. Antihistamines or steroids may help control reactions to allergens in your dog's environment if they can't be eliminated easily. Your vet may give your pup allergy shots to decrease his body's reaction to the allergens that are plaguing him. She may recommend that you use a flea preventive medication to treat flea-based allergies. Weekly bathing with a prescription shampoo can help relieve contact allergies due to environmental factors such as pollen, dust or mold. If your vet suspects your pup has food allergies, she will put him on a special hypoallergenic diet. These diets contain only a few unusual ingredients not normally found in dog food or hydrolyzed proteins. 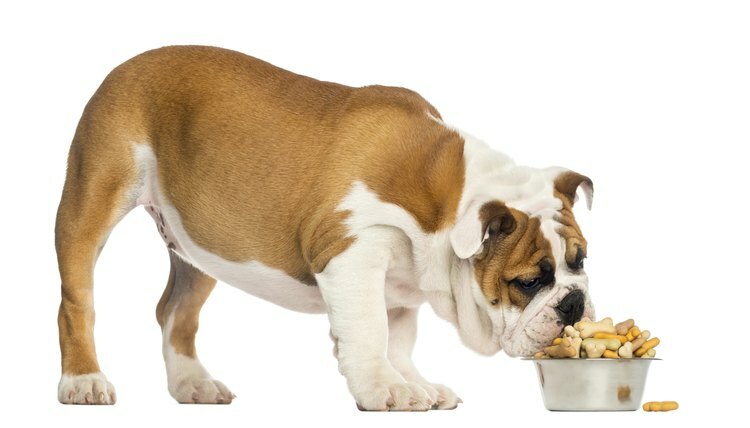 You feed the diet for 12 weeks to see if your pup's symptoms improve. If they do, ingredients are added back into your pup's diet to determine which ones he is allergic to. In addition to veterinary treatment, there are some things you can do to provide your pooch with some relief from his allergies. Use hydrocortisone-based sprays on itchy skin to help provide immediate relief for your pooch. Bathe him using a soap-free shampoo containing oatmeal or aloe to get rid of dust and pollen on his coat and to soothe his skin. Wash his bedding and vacuum your home one to two times weekly to eliminate potential allergens from his environment. Supplements containing omega-3 and omega-6 fatty acids may help reduce your pup's skin inflammation and itching.